This tutorial on How to Make an Easy Bunny Cake contains affiliate links. This post is brought to you by my very creative mother, Betty. She’s made this cake off and on almost every year for Easter. She also makes a really awesome Easter basket cake too! Do you remember any of your relatives or friends making this one too? 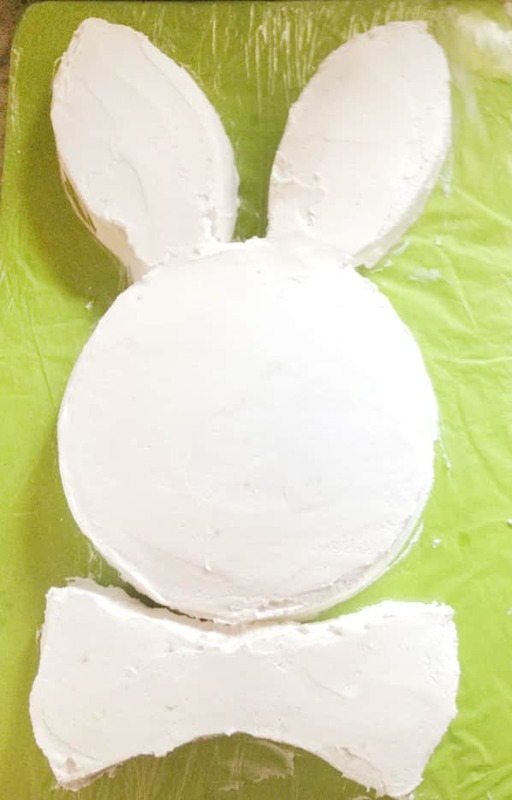 I love how simple and fun it is to make this Bunny Cake! No special cake pans are required. 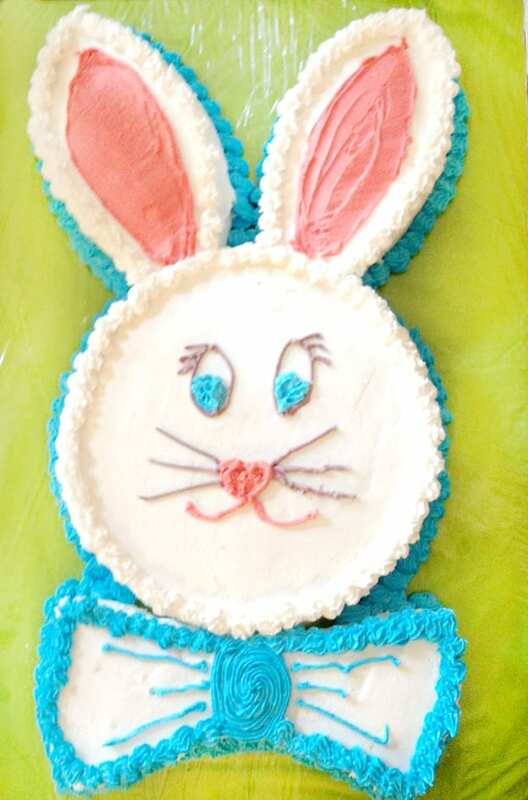 Just 2 8 inch round cake pans is all you need to make this easy Bunny cake. We like to use the 8-inch size cake pans (affiliate link) which serves around 30 or so people with a small piece each. You’ll also need a large rectangle cake board to put the cake on. Once the cuts have been made you can add the two ends at the top like ears. 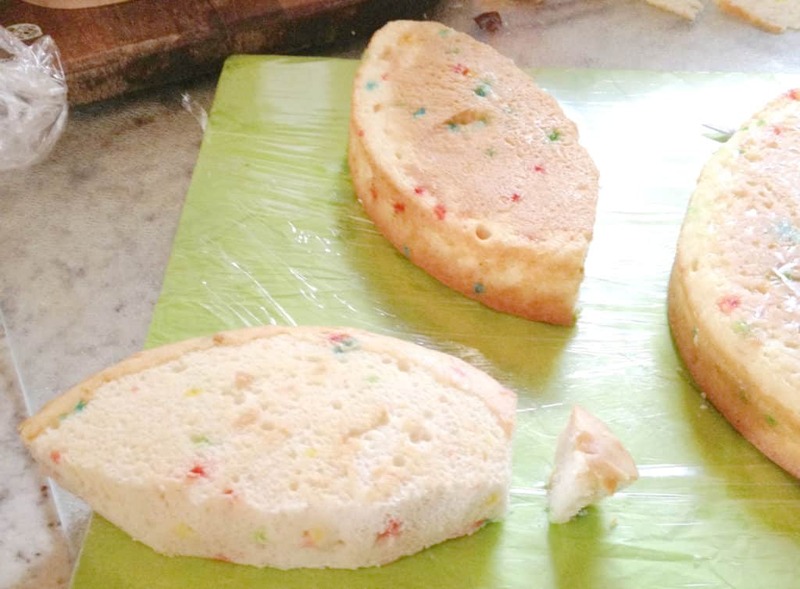 She cuts the ears down a bit at the bottoms to make them flush with the other cake. The middle part goes at the bottom for a bow. Then ice the whole cake with decorators icing. Then add the decorations. She uses the star tip (affiliate link) to make the outlines and she uses a size 5 piping tip (affiliate link) for the rest. Such a simple and CUTE cake for Easter!!! Here’s a short video I made to show you how easy it is to make this bunny cake! This was a featured recipe from a 1970s magazine to which my mother subscribed, probably Women’s Day or Family Circle. It had coconut pressed into the icing (bunny fur). I made it a few times during my teenage years. I think this came from the old Baker’s Coconut bags.